German dramatist; born at Berlin Dec. 6, 1859; son of the theatrical publisher Eduard. 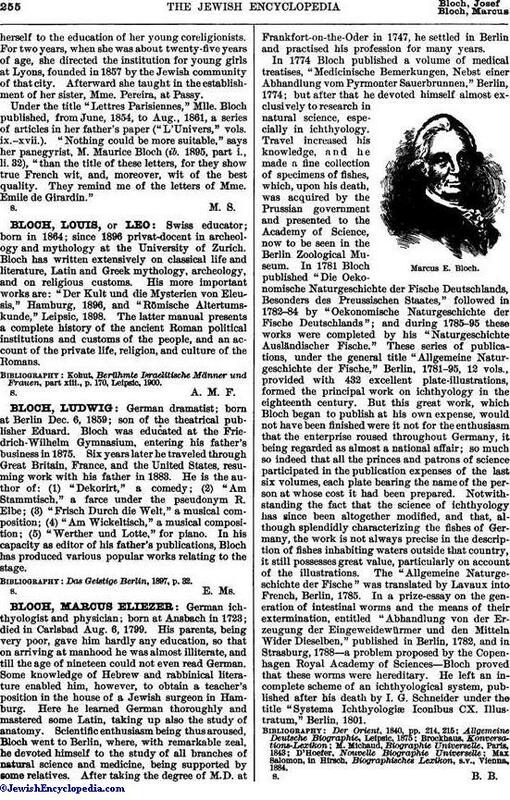 Bloch was educated at the Friedrich-Wilhelm Gymnasium, entering his father's business in 1875. Six years later he traveled through Great Britain, France, and the United States, resuming work with his father in 1883. He is the author of: (1) "Dekorirt," a comedy; (2) "Am Stammtisch," a farce under the pseudonym R. Elbe; (3) "Frisch Durch die Welt," a musical composition; (4) "Am Wickeltisch," a musical composition; (5) "Werther und Lotte," for piano. In his capacity as editor of his father's publications, Bloch has produced various popular works relating to the stage. Das Geistige Berlin, 1897, p. 32.